Explore what Alma intended never to forget by seeking the five highlighted areas of the image below. 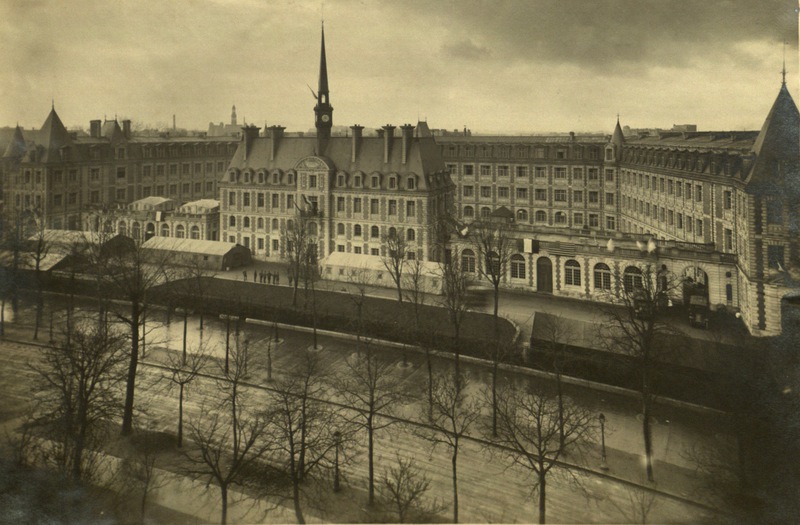 This interactive digital project incorporates several forms of historical evidence (photographs, handwritten notes, memoir, songs) to “tour memory” at an American Red Cross military hospital located in Neuilly-sur-Seine, a suburb of Paris, France, and during the Great War’s years. 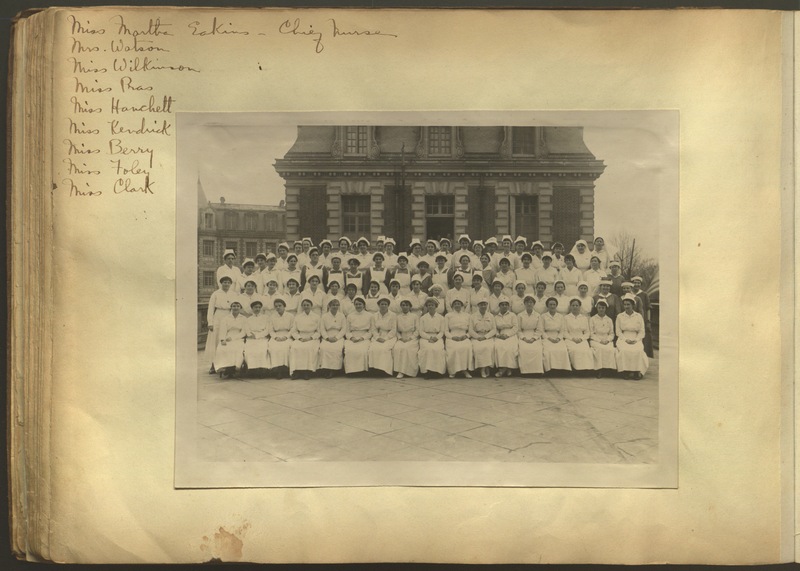 Today’s visitors to the hospital (via this project) can explore the work of the hospital, enter its interior wards, and perhaps meet a volunteer nurse, Alma Clarke, who compiled in a scrapbook these memories we are touring. Alma Clarke was an auxiliary nurse for the American Red Cross during WWI and arrived at Military Hospital No. 1 seven days before Armistice. 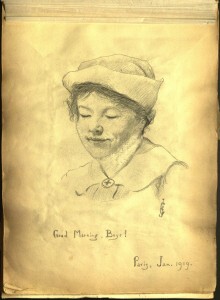 During her service and care to the patients at the hospital she kept a scrapbook and from which all photographs, sketches, and handwritten notes in this digital project come. In it, she included few images of herself. We might guess that she choose to collect memories of her role in the hospital as but one of many more volunteers – medical and enlisted personnel – and as part of a complex organization in the war effort, and certainly to heal. 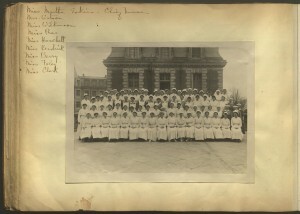 We might also guess that she wanted to remember as many details of the hospital as she could (as seen in her scrapbook’s multiple photographs captioned in her own hand), about her service among the nursing staff and surgeons, and about those many soldiers she met as patients. Visitors to “Touring Memory” can find in three large images (image maps) many more memories. By selecting the highlighted areas in each, we can progressively dive deeper into how Alma Clarke represented her memories (how she choose to remember) and with them, remember the work at Military Hospital No. 1. The first image map, “Tour and Explore Alma’s Collected Memories,” suggests how a visitor might be impressed by the site of the hospital, the Lycée Pasteur, and its grand exterior (perhaps just as Clarke herself was impressed in 1918.) In the photograph are six highlighted areas, the hospital’s designated entrances, to begin an exploration of the medical work of war. Supplementing the photographs taken from the scrapbook are other visitors’ contemporaneous accounts: from a surgeon, visiting nurses, an observer who wrote about Red Cross activities in France, at Hospital No. 1 and its ambulance service. 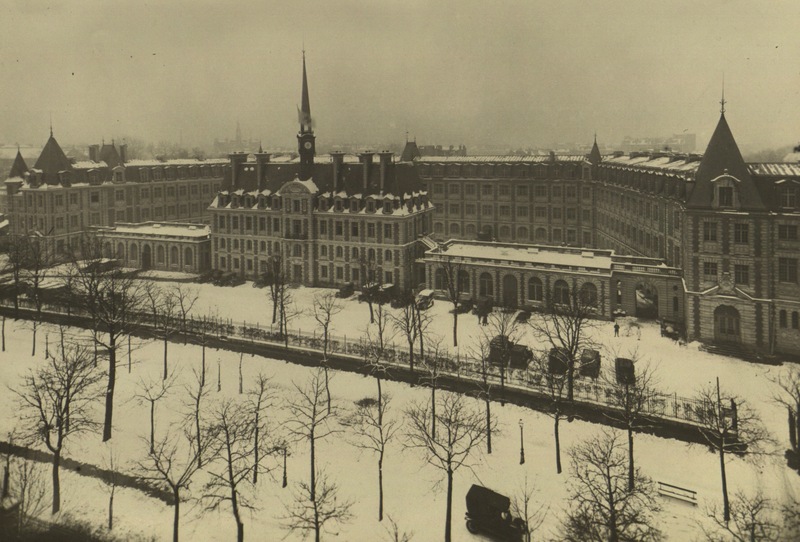 It is doubtful Alma knew these people (their time at the hospital preceded hers), however their accounts help to narrate, through memory, the hospital’s organization and its care for the wounded. Next, the image map, “Explore the Interior of Military Hospital No. 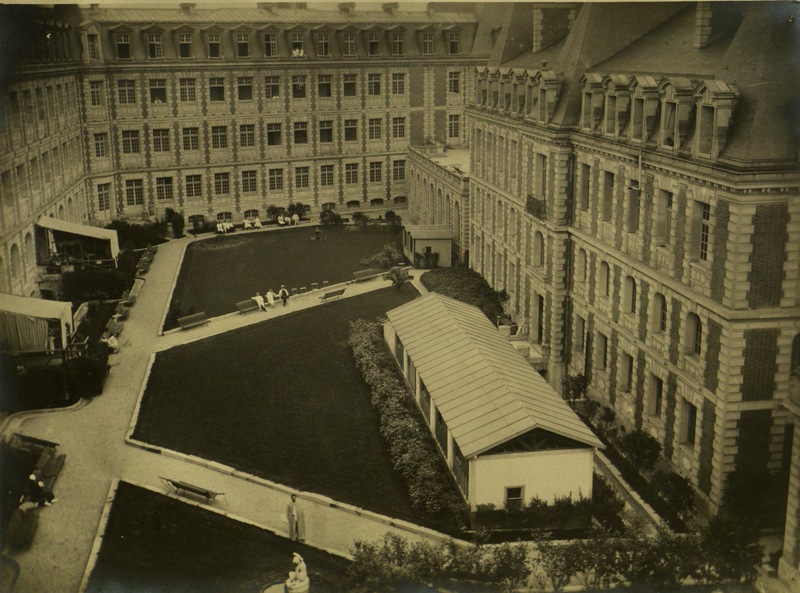 1,” pictures the hospital’s inner courtyard (in it are eight images), so that we may enter several interior wards and see the daily functioning of the hospital, its order and cleanliness, recuperating soldiers, and the corridors and rooms that volunteers like Alma walked in and worked in. Placement of the highlighted areas, such as the “Boston Ward” or the “Jaw Ward,” does not always designate the historically accurate locations of the interior views. Instead, locations were approximated based on Alma’s handwritten captions (“second floor corridor” – but which wing of the hospital? ), by using the size of the windows, or other visual information contained in the photograph, e.g., what can be seen through the windows or the interior structure of the room. The “evacuation ward” and the locations of the courtyard and where the ambulances were parked are accurately located in the image maps. The final image map, “Seeing Alma,” attempts to create a reflection of her through the handwritten notes of others – particularly those patients she cared for. She asked patients at the hospital to record in her scrapbook their name and rank, where they were wounded, and how. 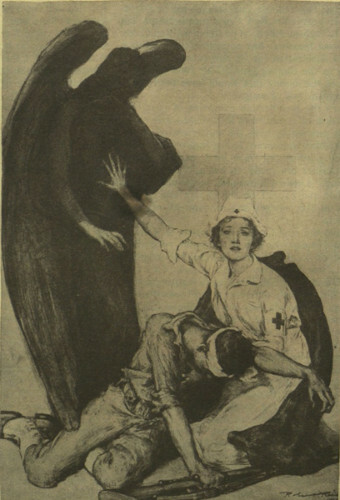 A sampling of these notes can be found in the final large image, an illustration from Clarke’s scrapbook of a Red Cross nurse protecting a wounded soldier from death. “Touring Memory” includes only two images of Alma – a blurry photograph and a sketch – to encourage exploration of what Alma wished to remember in her scrapbook, and to encourage a “visitor” to Alma’s memories to “see” her, as did her patients in 1918. Taken as a whole, “Touring Memory” reveals layers of memories to investigate space, place, and the act of remembering. The first layer reveals a social history of the medical work of war at Military Hospital No. 1. Who performed this work? How was it accomplished? We may gain a sense of the hospital’s wards and workings, as well as its specialization, such as attending to facial injuries in the “Jaw Ward,” but we do not see all work, like those who mopped the floors or cooked patients’ meals. A second layer of investigation encourages visitors to think about how Alma Clarke’s scrapbook is a credible, “insider’s” view (Alma’s), yet we are exploring collected memories: selected, subjective, and of what she wished to remember (or what artifacts she had available to remember.) Similarly, “Touring Memory” contains only 27 selected images from her scrapbook’s 178 digital pages. While the images taken from it are representative of its contents (photographs, sketches, handwritten notes), its layers of meaning designed here for a “visitor” to explore and “tour” are certainly not all that might be gained from Alma Clarke’s preserved recollections. Thus, a third layer of memory is this project’s own reconstruction of remembering a hospital’s crucial work during World War I. All images – photographs, handwritten notes, sketches – are reproduced from Alma Clarke’s “English WWI Scrapbook,” preserved in its original form and available digitally at Bryn Mawr College. Courtesy of Bryn Mawr College Special Collections. Two WWI-era songs, “Au Revoir but Not Goodbye” and “Oui Oui Marie,” are courtesy of “Popular Songs of WWI.” USCB Cylinder Audio Archive. University of California Santa Barbara Library. Acknowledgements: Thank you, Professor Deb Boyer, for being able to imagine my envisioning of a “tour” and your suggestions of helpful digital tools to do so. At Villanova’s Falvey Library thanks go to David Uspal for finding hidden code (and deleting it) and Laura Bang for teaching me care in the digital preservation of archival materials. Final thanks are to all graduate students in Fall 2015’s “Digital History” course for their semester-long collaboration and creativity.